Free to download, edit, and print. Also available: all the calendars on this site - Hebrew and Gregorian - through the end of 5779 and 2019 for just $3.99 in PDF form. 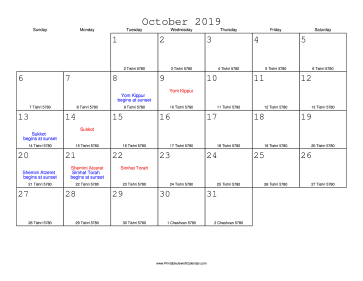 This free printable Hebrew calendar is easy to download, and print. With Printable Jewish Calendars in PDF format, you can download and print the calendars any application that can read PDF files. If you don't see a Jewish calendar design or category that you want, please take a moment to let us know what you are looking for.